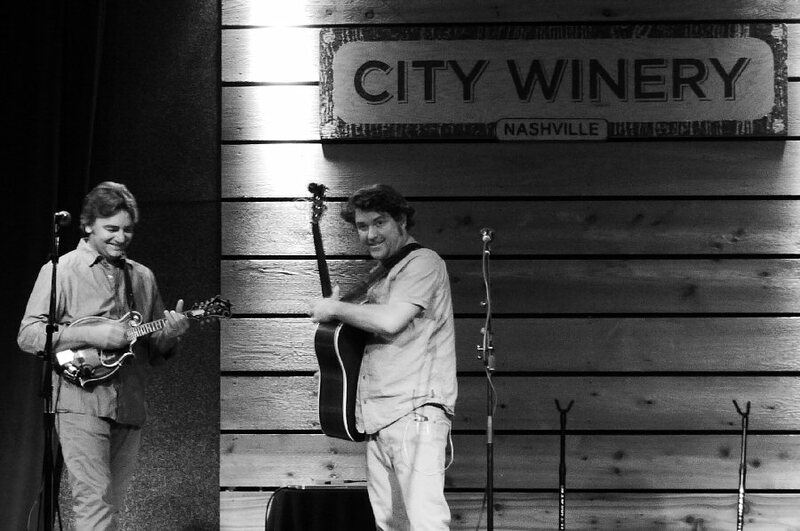 The whimsical Keller Williams intoxicated his fans with a fun filled show at Nashville’s City Winery on December 11, 2015. The City Winery is a warm, circular room. Most shows are seated. They serve beer, food and a large selection of wines. Keller’s set-up at the sizable City Winery stage consisted of a bass and guitar clamped to stands along with effect pedals and a looping machine. His music can run the range from folk, funk, jam, reggae and rock. Williams’ lyrics are sometimes quirky often delivered in a quick rap. 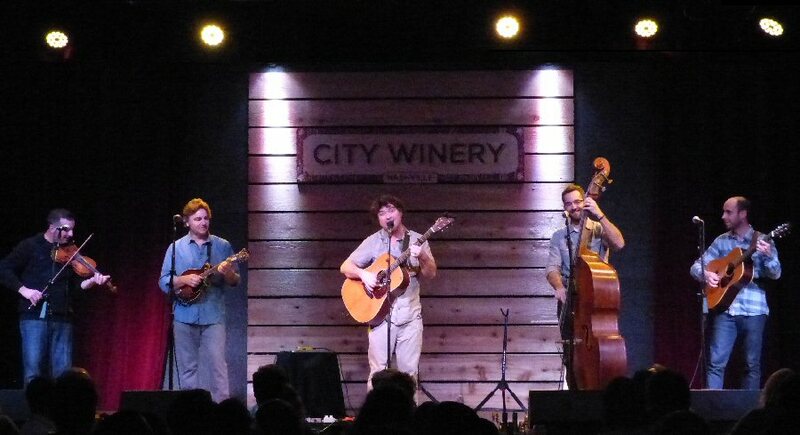 Keller Williams and friends on stage at the City Winery in Nashville. Williams was casually dressed as he strolled out armed with an acoustic. He was agile on the guitar blending strumming with string taps while spinning around in circles for a few notes. Keller started singing “Put Another Log on the Fire” a funny hilly-billy-like lament where the narrator lists a bunch of demanding chores for his baby and then ponders why she is leaving him. He continued to creatively blend picking and taps throughout the next few numbers. Keller’s approach can be like a kid moving from one toy to another or in his case instruments which is a joy to watch. He started crafting a bass line before shifting to a drum pad for more beats, he danced a bit as he played the acoustic in real time over the layered loops. His lyrics are visual yet often odd. “She Rolls” was a fine example of Keller’s rhyming paired with wry and witty storytelling. Keller Williams is a solid performer alone or in various group configurations. “Plush” now sounded like a Keller song as he strummed and tapped his way through the dark Stone Temple Pilots tune in honor of the recently fallen Scott Weiland. He crafted another loop asking fans to chant “Om” as he added Middle Eastern tones to the mantra mix. He aptly played the acoustic and whistled sharing a scenario of shopping at Target for the basics while sporting an “Over The Shoulder Rocket Launcher”. Again a funny narrative that one could almost picture Williams wandering around a store looking for organic fruit weighed down with the heavy artillery. Next was a tale of a Price is Right dream that showcased a duet with country star “Blake Shelton”. Friday night’s show featured special guests The Travelin’ McCourys who are a well-respected progressive yet traditional bluegrass band. They collaborated with Keller on the Pick (2012) album. The 12-track record was a blend of bluegrass with a groove. The Travelin’ McCourys with Keller crafted an innovative version of Donna Summer’s “Hot Stuff”. There are not many groups that can play a disco hit bluegrass style but these guys sure did. Keller added some beat-box as they transitioned into Tom Petty’s “You Got Lucky” with the mandolin and fiddle filling in for the lead guitar parts. 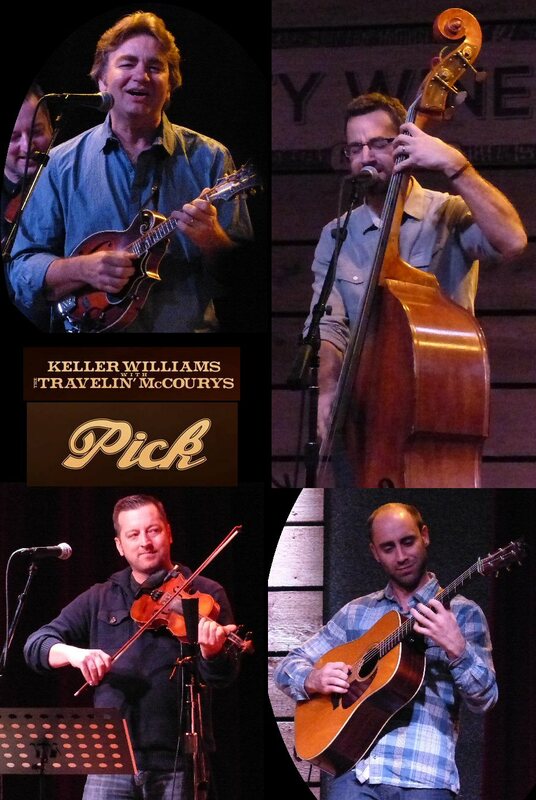 Keller Williams with members of The Travelin’ McCourys bring Pick to life. “Freaker by the Speaker” had fans clapping and singing along as the pace picked up. At this point a number of folks were dancing to the up-tempo bluegrass music that Keller and The Travelin’ McCourys were playing. They slowed it down for “Candyman” but the encore was a fast and fluid bluegrass jam to end the night on an exuberant note. 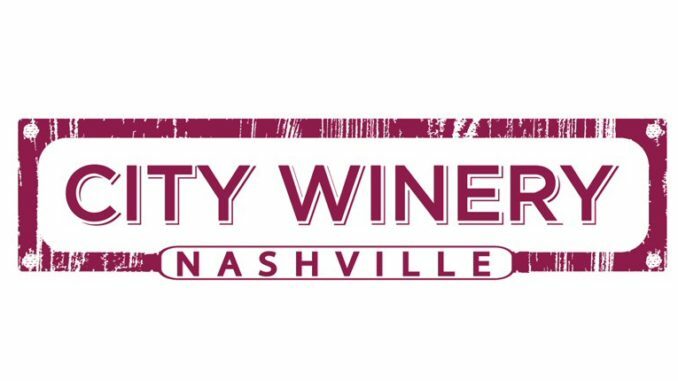 The City Winery located at 609 Lafayette Street, Nashville, Tennessee features a wide range of artists such as Keller Williams. It has a full service dining room, a music venue and an extensive wine list. Upcoming concerts at the City Winery include Rhett Miller, Raul Malo, Willis Alan Ramsey, Gay Ole Opry and John Anderson. 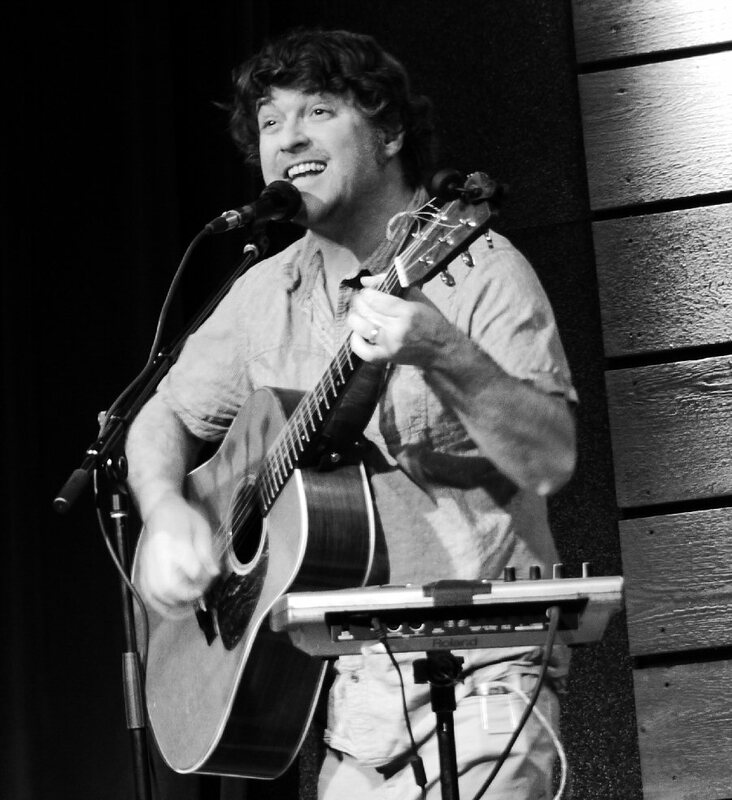 Fans and musicians alike were all smiles during the Keller Williams concert in Nashville.